Can you believe that it's almost been one year since THE AVENGERS blockbusted us? Well, get ready to get riding again with Tony Stark (aka Iron Man) as the third installment, IRON MAN 3, is shooting off on May 3, 2013. Lucky for us soundtrack-folk, the original score by BRIAN TYLER will get to us on an earlier flight than the film. Hollywood Records (Where have they been, by the way?) is releasing the soundtrack on April 30th and you, our fine, soundtrack-genius, friends are going to want to have this on pre-order. Suffice it to say, those things you loved best from the scores of THE DARK KNIGHT, THE AMAZING SPIDER-MAN, and even THE AVENGERS all come together here with Brian Tyler tying it all together with his signature sound. You might say, "Wha?" "Huh?" But you can just stop that now and do some trusting. It's quite a ride...with a final track that you are NOT expecting...but will probably love. For all of the important deets, you can read the full presser below, including some insightful quotes from Tyler. To make it easy on you, here is that little pre-order link. Use it and help support this site. Thanks! Burbank, CA -- April 5, 2013-- Marvel Music/Hollywood Records will release the original motion picture soundtrack for “Marvel’s Iron Man 3” on April 30, 2013. Brian Tyler composed and conducted the original score. 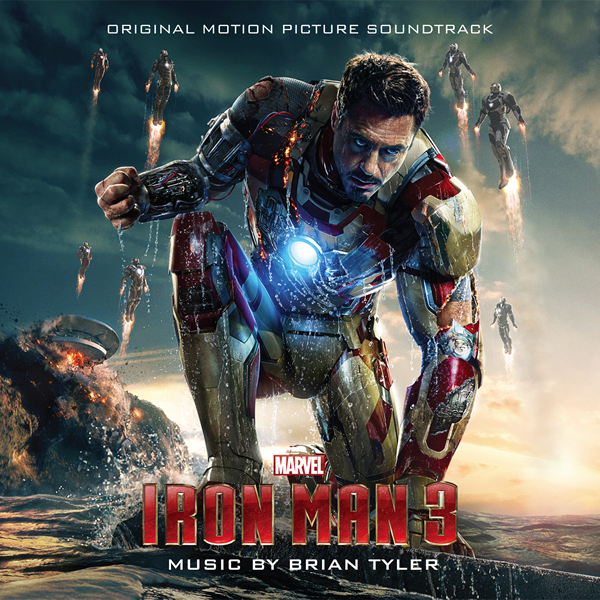 Marvel’s Iron Man 3 original motion picture soundtrack will be available wherever music is sold on April 30, 2013.